Immunochemical staining of ferret CD8A in ferret spleen with rabbit polyclonal antibody (1 µg/mL, formalin-fixed paraffin embedded sections). Characteristics Produced in rabbits immunized with purified, recombinant Ferret CD8a (rF CD8a, ABIN2008785 ABS50091.1, Met 1-Glu 186,. CD8a specific IgG was purified by Ferret CD8a affinity chromatography. Background T-cell surface glycoprotein CD8 alpha chain, also known as CD8a, is a single-pass type I membrane protein. The CD8 glycoprotein is expressed by thymocytes, mature T cells and natural killer (NK) cells and has been implicated in the recognition of monomorphic determinants on major histocompatibility complex (MHC) Class I antigens, and in signal transduction during the course of T-cell activation. Both human and rodent CD8 antigens are comprised of two distinct polypeptide chains, alpha and beta. The Ig domains of CD8 alpha are involved in controlling the ability of CD8 to be expressed. Mutation of B- and F- strand cysteine residues in CD8 alpha reduced the ability of the protein to fold properly and, therefore, to be expressed. Defects in CD8A are a cause of familial CD8 deficiency. Familial CD8 deficiency is a novel autosomal recessive immunologic defect characterized by absence of CD8+ cells, leading to recurrent bacterial infections. 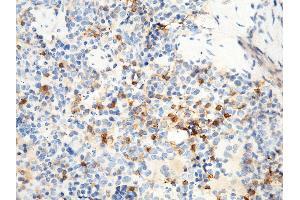 This antibody can be used at 0.1-0.2 μg/mL with the appropriate secondary reagents to detect Ferret CD8A. The detection limit for Ferret CD8A is approximately 0.00975 ng/well. Storage Comment This antibody can be stored at 2°C-8°C for one month without detectable loss of activity. Antibody products are stable for twelve months from date of receipt when stored at -20°C to -80°C. Preservative-Free. Sodium azide is recommended to avoid contamination (final concentration 0.05%-0.1%). It is toxic to cells and should be disposed of properly. Avoid repeated freeze-thaw cycles.